This series was first conceived by Christine in 1971. The designs were produced as collectable figurines in 2001. 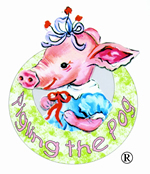 This wacky, humorous series looks at life through the eyes of Pigling the Pog and her friends, Doris, Boris and Baby Peepo. Whimsical, Wacky, hilarious, appealing and delightful. What makes this brand so special? Wonderfully appealing artwork. Each design has a story with it. Humorous designs suitable for character licensing. From very young children to adults of all ages. Collectables, giftware, homewares, stationery, crafts, clothing.